You want pie, you need pie, you deserve PIE! I have a personal belief that everyone deserves a good fruit pie in their life. We should all have pie on a regular basis to ensure domestic happiness. And lucky for you a berry pie is one of the easiest things to make-no peeling, no cutting fruit. 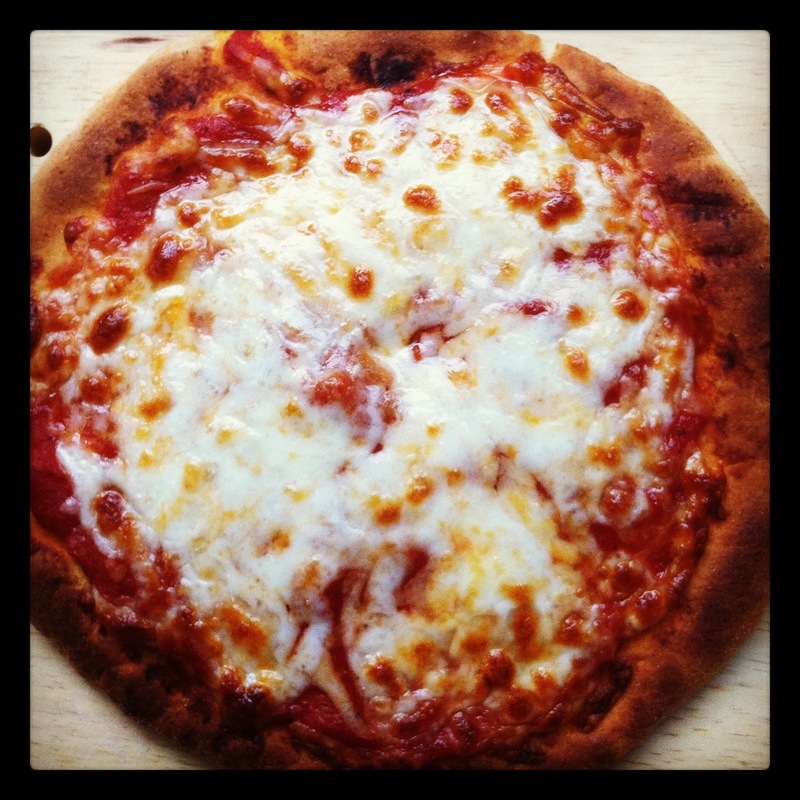 In this recipe I roll out a pre-made crust and it works just fine for me. A note about crust: true pie aficionados will hold forth on the ease and importance of a homemade crust. Once upon a time in the land before kids I too measured out ice water in tablespoons and used my sixth sense to determine when to roll and flatten the dough. That was in San Francisco where the air is cool and wet all year. Then I moved to the east coast where the weather is muggy and hot in the summer, freezing and dry in the winter. My crust-making skills had to be re-learned. A baby arrived shortly after I landed on the east coast and I learned to love those crusts that you buy already formed into two discs that only need to be thawed and rolled out. In this blueberry pie you see here I’ve only used one crust and made it into a sort-of tart. This is because I did not have enough fruit to make a full pie. I give you here the recipe for a 2 crusted blueberry pie. Check back in September for my apple pie, one of the basic food groups of life. Toss fruit with sugar, lemon juice and zest, spices, and tapioca; let stand for 15 minutes. Roll out one of the dough rounds and fit into the bottom of a 9” pie pan with a little dough overhanging. Fill with the fruit mixture. Scatter the butter pieces over the fruit. Un-roll the second crust, it may not need to be rolled with a rolling pin, it should fit right on top of the pie. Place the second crust on top. Fold the overhanging crust on top and pinch shut with a fork or by squeezing between your fingers. Place on a baking sheet and bake 20-25 minutes. Lower the temp to 350 and continue to bake until juices bubble and crust is golden brown, 30 to 40 minutes longer. Transfer to a wire rack and let cool to room temperature so the juices can thicken. 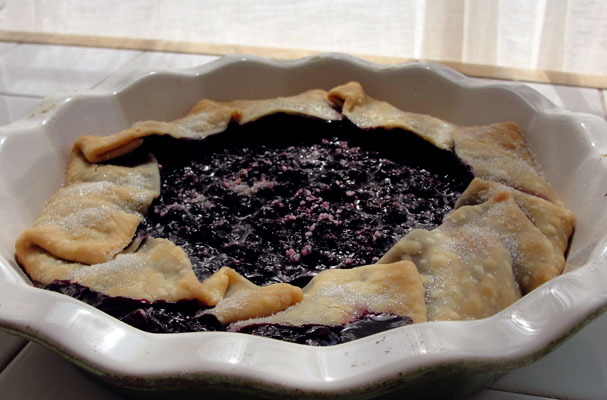 This entry was posted in Snacks and tagged blueberries, dairy-free, easy, pie on August 15, 2012 by nursingmomscook. There is nothing more comforting to me than a big plate of homemade Mac & Cheese. If you’re a hungry nursing mom with a hankering for something satisfying, this should do the trick. For those who have to give up dairy I’m really sorry to say that there is no substitution for the real thing here-“cheese” is in the title after all. But if you are wheat-free do not despair! You can use gluten-free penne (usually rice based) and it comes out just fine. I never realized how little I could accomplish in a day until my son was born. One of the biggest challenges to cooking with a new baby in the house is that you cannot complete all the steps to a recipe at once. Inevitably someone has to be nursed, changed, held in the middle of prep work. Fortunately, you can cook the pasta ahead of time, like in the morning, and set it aside for later. You can grate the cheese ahead of time or use pre-grated cheese such as cheddar or mozzarella (or a combo of the two). You can assemble the whole thing and keep it in the refrigerator for a few hours before putting it in the oven. Best of all, if you don’t eat the whole dish in one sitting, wrap it up in individual servings and put it in the freezer. -Cook the penne according to the directions. Set aside and let cool. -If you are going for the swiss chard option: remove any thick stems, steam the chard until wilted-about 5 minutes. It should change to a dark green color. Put it in a food processor and pulse until the chard is finely chopped. Drizzle a little olive oil in the final pulses to give it a thicker consistency. When the milk is hot melt the butter in another heavy saucepan. Add the flour and whisk over low for 5 minutes. Do not brown. Remove from heat. Add the hot milk to the flour mixture and whisk well. Add ½ tsp of the paprika, season with salt and pepper, return to the pan to heat. Cook over medium heat whisking constantly until the mixture thickens, about 5 minutes. Add to the penne and toss well. 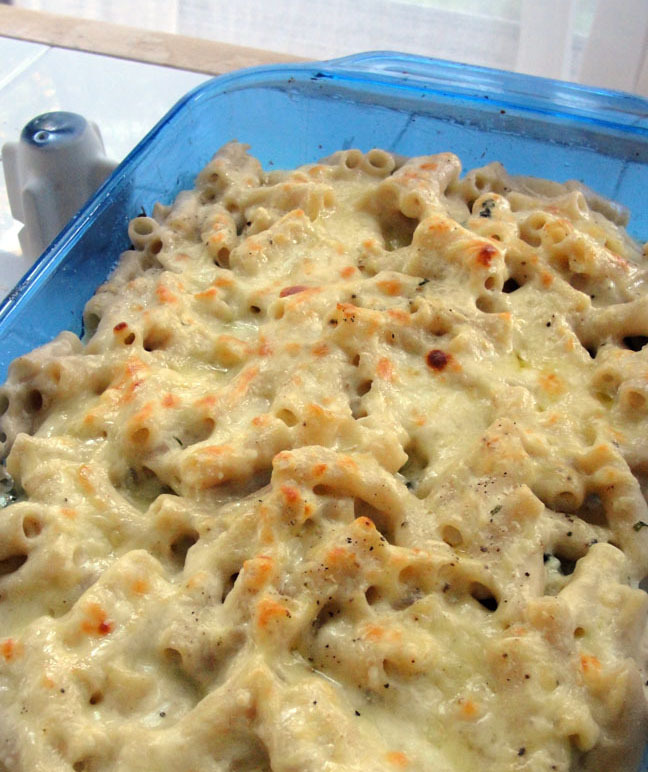 Butter a 13x9x2” flameproof baking dish and fill it evenly with the penne sauce mixture. If you choose to add the greens, fill the baking dish halfway, add the pureed layer of greens spreading it across the whole pan, add the remaining penne. Distribute the grated cheese evenly over the penne, sprinkle the remaining paprika with a little pepper. Place the dish on a baking sheet and bake until hot, 20-25 minutes. Place under the broiler for 3 minutes or until slightly browned. This entry was posted in Dinner on August 15, 2012 by nursingmomscook. 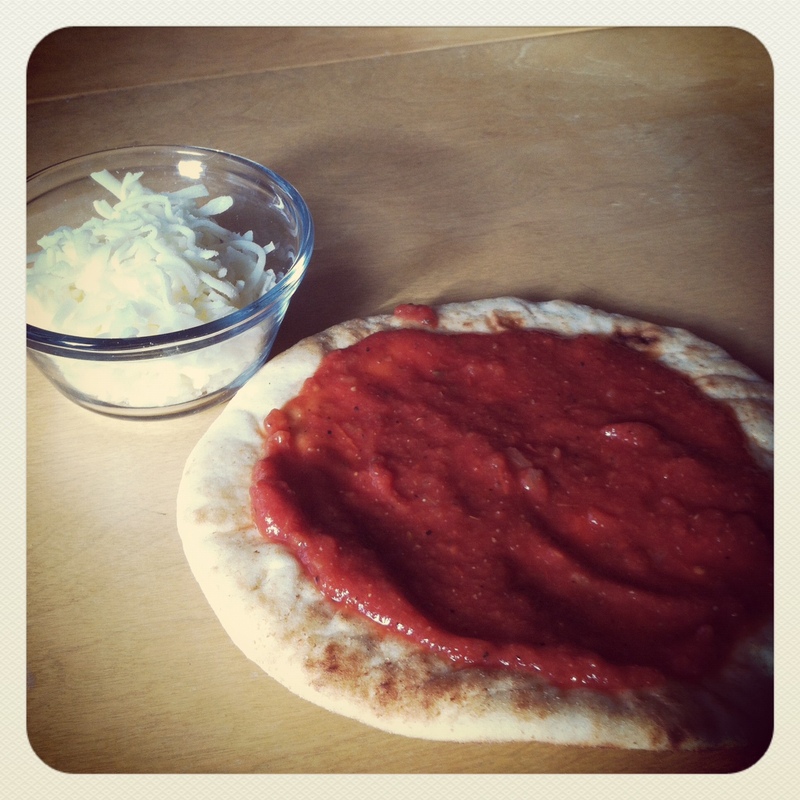 Impossibly easy personal pizzas-File this under fast meals. I found these individual sized pizza crusts in the deli section of my local chain grocery store and they are fantastic. A little bit of sauce from a jar and some pre-shredded mozzerella, 5 minutes under the broiler and I had mini-pizzas for everyone! A few weeks ago I made a small batch of pesto from an enormous bunch of basil I bought at the farmer’s market and put it in the freezer. I thawed the pesto, spread it on one of the crusts, covered it with cheese and voila! Personal pizzas. This entry was posted in Dinner on August 6, 2012 by nursingmomscook. Hummus is another one of those I-can’t-believe-it’s-so-easy-why-haven’t-I’been-making-this-my-whole-life foods. What I give you here is a basic template for plain hummus, add any flavorful ingredients you like as you see fit. I like to use extra garlic and I’ve been known to add in fresh basil or roasted red peppers. This recipe makes a boatload of hummus, perfect for the Come See the Baby crowd or to take some to a neighbor as a gift. In a food processor, combine the first 6 ingredients blending until smooth. Add salt to taste. This entry was posted in Snacks on August 5, 2012 by nursingmomscook. I have a chickpea salad in regular rotation on my summer menu that can be whipped up in an instant. I’ve often bragged about how yummy it is to friends until they beg me for the recipe. I’ve even gone so far as to keep a photo on my phone of the page in the magazine where I got the recipe so when someone texts me for the recipe I just shoot it off to them. 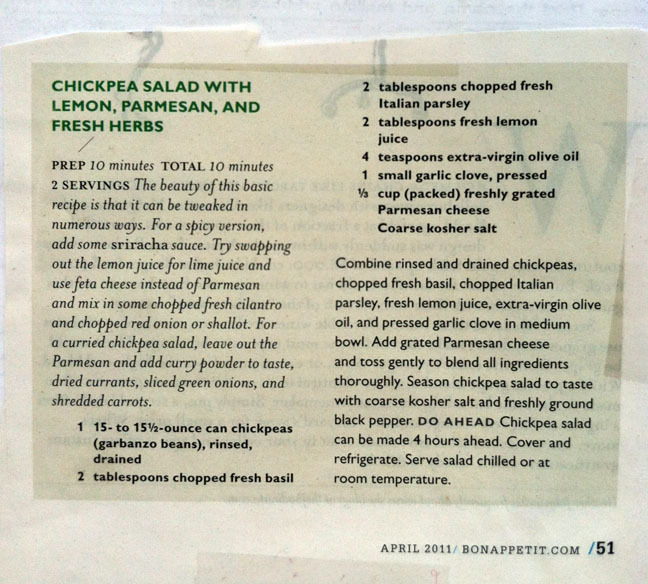 The author calls for one 15oz can of chickpeas but i find the dressing to be a bit much for that proportion and it makes only enough for a small side dish or a lunch for one person. I often use two cans of chickpeas. Some brands of chickpeas are better than others when eaten raw. I almost always use Goya for this salad. Make sure everything you use here is really fresh and use the best quality olive oil that you have. This entry was posted in Dinner, Lunch on August 5, 2012 by nursingmomscook. August is here. The weather is so horribly sticky hot and miserable that I cannot bear to cook. Fortunately the farmer’s markets are bursting with beautiful vegetables and leafy greens that require a only minimum of prep work. The low labor quotient is what I love about this soup-simple ingredients, very few steps and you can serve it cool. After I picked up some beautiful yellow squash at the farmer’s market this morning, I turned to an old recipe scrapbook of mine to find this recipe. I have this scrapbook from when I first taught myself how to cook. Its filled with photocopies of recipes from food magazines, roommates’ cookbooks, and newspaper clippings. I spent 10 years filling this thick little book with food memories of wonderful meals shared with friends and roommates from my time in San Francisco. Back then, I lived in a flat with 3 other people and a huge eat-in kitchen which was the center of life in the house. We had a small library of cookbooks thanks to years of revolving door roommates and I would go through them until I found something interesting that I felt my limited skill set could handle. Then I would go to one of the many local farmer’s markets and pick up what I needed. Everyone in my house benefitted from my learning to cook phase through group meals and copious leftovers. On hot August days in New York like today when I’m dripping sweat at 9:30 am, I think longingly of all those foggy evenings of food and friends in San Francisco. Heat the olive oil in a medium saucepan over medium heat. Add the squash and chives and sautee until just softened, about 3 minutes. Add the chicken stock and simmer for about 5 minutes. Place in a blender or food processor or use a stick blender to puree the mixture. Refrigerate until cool. Whisk in the lemon juice, sour cream, salt and pepper until well combined. Taste for seasoning. Ladle into soup bowls and garnish with a dollop of sour cream and a sprinkling of chives. This soup is attributed to Dianne Rossen Worthington but I have no idea which cookbook I copied it from. Forgive me Diane! This entry was posted in Dinner, Lunch on August 4, 2012 by nursingmomscook.